This post is dedicated to the best rated and top selling Radeon graphics cards of 2011 – 2012. nVidia GeForce fans look away for a moment, we’ll be reviewing the best nVidia cards in the next few days. Order is based upon sales, customer reviews, ratings, and value for each price point rather than which card simply has the most dedicated memory. Sapphire has been making video cards for years that gamers value for both their performance and durability. 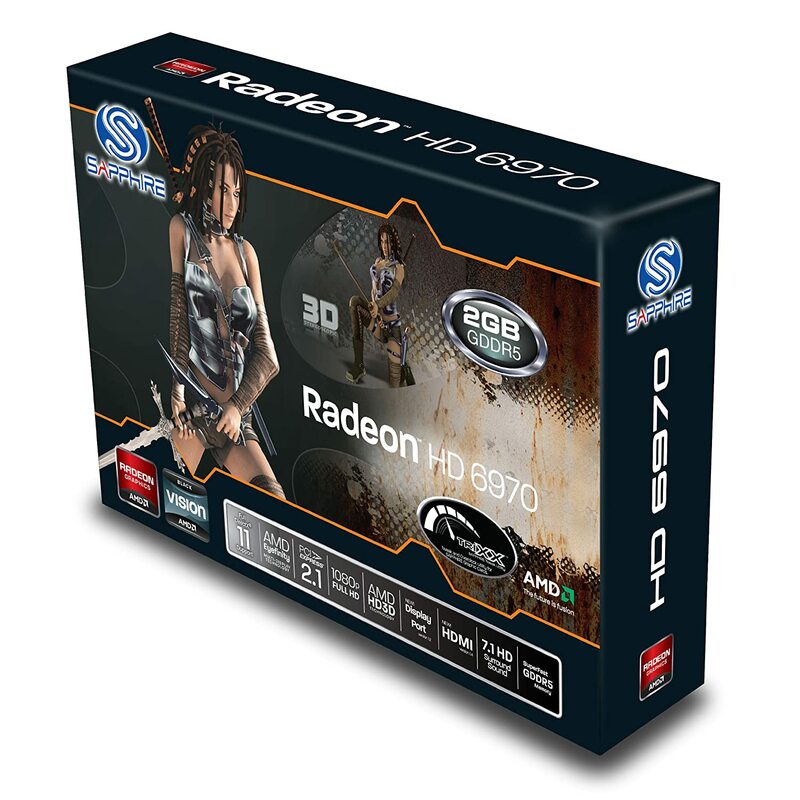 The HD6970 comes with AMD’s eyefinity technology which allows support for up to 3 screens. If you’ve never seen the difference between playing on a single screen vs. triple, you’ll be amazed at how much you can see with your peripheral vision. You also get 1536 stream processors and 2GB of DDR5 dedicated memory – plenty for running the latest games on high resolution settings. AMD HD3D Technology gives you 3D gaming and movie support to take your entertainment experience to the next level. Another key feature to the HD 6900 series from Radeon is the AMD powertune technology which automatically adjusts your graphics card power draw in order to give you increased performance. 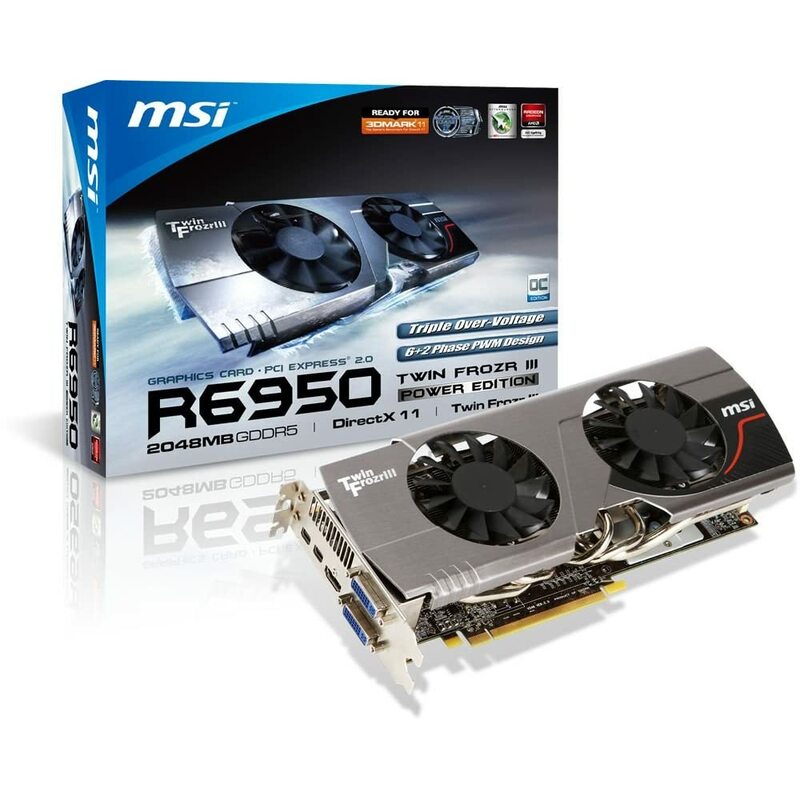 An alternative in this price range would be to crossfire 2 HD 6850s. Additional details include 1 x HDMI, 2 x Mini DisplayPort, 2 x DVI connectors, Direct X11, up to 2560 x 1600 resolution, and a 2 year parts and labor warranty. Overall: Overall you get great value with the HD 6970 and while it has come out that updating the Bios from the HD6950 is possible this is still one of the best GPU options available for those that don’t want to void their warranty or tweak their graphics card. For those looking for a great gaming graphics card with lots of cooling MSI’s R6950 TWIN Frozr offers 20% more airflow than most GPU. It’s a fact that cooler hardware not only performs better, but lasts longer as well. The secret to the R6950 is the dual fan cooling which makes the GPU 11℃ cooler and 13.9dB quieter than reference HD 6950. The R6950 uses Radeon’s Afterburner technology which allows the graphics card to boost performance in real time. Like the HD 6970 the R6950 has eyefinity technology for multi-monitor streaming play. Overall: This is a great value play, after all, if you are willing to take a little bit of a chance you can update the bios for an inexpensive HD6970. The cooling options are great as well. On sale this HIS version of the HD6950 is a great deal right now for around $40 cheaper than the R6950 (6/30/2011) and while it doesn’t have the dual fans, the $40 off sale makes it too tempting to pass up. Now that we’re hitting the $200 range a lot of these cards are super tempting to crossfire. 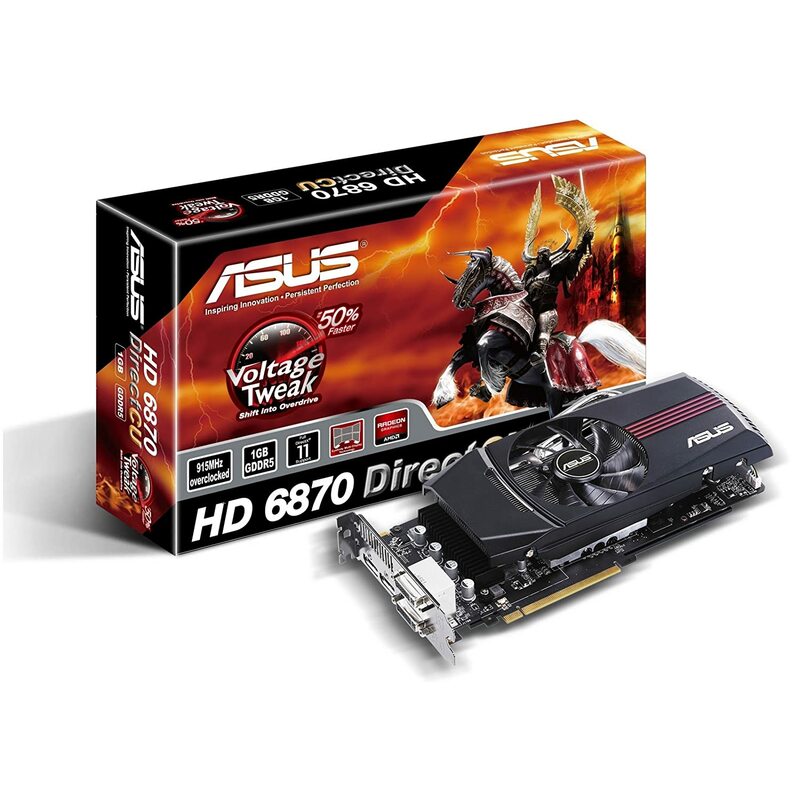 The most popular card at this price range as of this date is the Asus Radeon HD 6870. Features include 1120 Stream Processing Units, 1050MHz effective memory clock, DirectX 11, OpenGL 4.1, 2 x DisplayPort, 2 x DVI, 2 x HDMI 1GB GDDR5 memory size, 256-bit memory interface, max resolution 2560 x 1600, eyefinity support, and a 3 year parts and labor warranty. Overall: At this price point it’s hard not to look the direction of the HIS Radeon HD 6950 which gives you a lot more performance for only $50. Still, the dual DVI HDMI with eyefinity design is attractive for gamer’s looking for a flexible mid-level card. This card is a great deal right now – make sure to check for rebates and you’ll save yourself 15 bones. Specifications include; effective memory clock of 1000MHz (4.0Gbps), 1 GB memory size GDDR 5, DirectX 11, 1 x HDMI, 1 x DisplayPort, 2 x DVI, eyefinity support, max resolution 2560 x 1600, and a 2 year parts and labor warranty. Overall: If you can get it with the rebate it’s a great deal and a great option to crossfire. Specifications for the HD5850 include 1000MHz (4.0Gbps) effective memory clock, 1GB GDDR5 memory, Direct X11 Support. Ports include HDMI, Display Port, and DVI. Max resolution – 2560 x 1600. A perfect option for light gaming and your HTPC. Summary: We hope you’ve enjoyed this review of the Best Radeon Graphics Card for gaming in 2011. While we try to update our posts regularly the GPU market is constantly changing. Be sure to check our updated date at the bottom to make sure these picks are up-to-date. Did you find what you were looking for? If not, then please leave a comment below. Reader feedback helps us to keep our articles up-to-date. Also check out our tabs above for the top rated graphics cards of 2011-2012 and this review of the best gaming graphics card.